Week 4 on Identity in Stephen Downes’ E-Learning 3.0 MOOC has come to an end. It was another very interesting week. Stephen has summed up the week with a video and a paper, both of which I will link to in this post. They deserve to be widely distributed. I was pleased to hear him say this, as throughout the week I consistently felt that our digital identity is nowhere near the whole picture of who we are. As Stephen says it is just one outcome of ‘myself’, through which I can recognise parts of myself and others can get glimpses of me, or if they know me can recognise a bit more. I subscribe to National Geographic and this week I received a mailing from them which included this stunning photo by Yuri Andries. But it was the text underneath that caught my attention. ‘…. 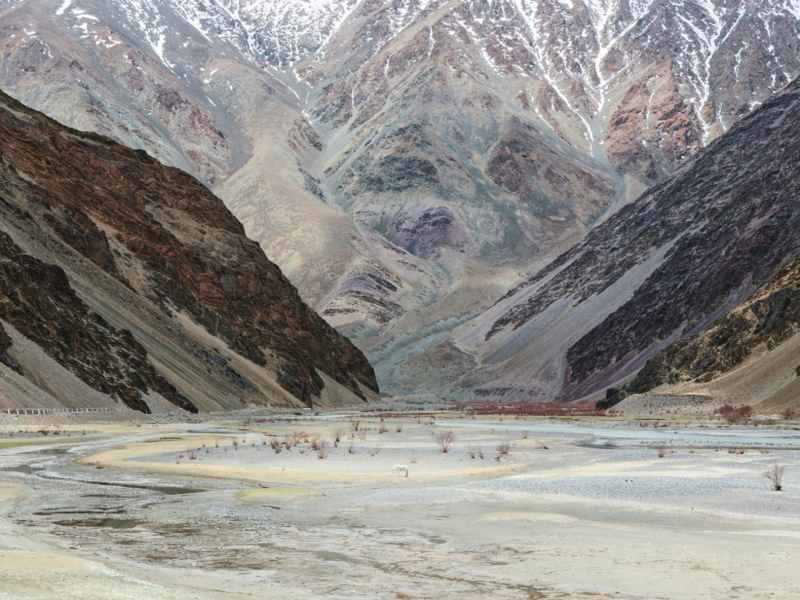 the photo was taken in Ladakh, a remote alpine region of northern India where Tibetan Buddhists, Shia Muslims, Sunnis, and Christians live in villages connected by rocky roads. There’s no phone signal, Internet, or gas stations, and hardly a single person in sight.’ So no digital identity for anyone living there, but of course that doesn’t mean no identity. I was struck by this because also this week I have been trying to understand what Stephen means by the ‘source of truth’ for the identity graphs we have created. How do we know the graph is an accurate representation of who we are? Where does the information come from? In his video Stephen says ‘we are the source of truth for our digital identity’; we are the thread that runs through the disconnected and distributed data that makes up our digital identity graph. Instead of our digital identities being about quantified demographics, they will (in E-Learning 3.0) be about quality, about the rich tapestry of data relations we have. In case your were wondering, there is a link in my thinking between the people living in Ladakh with no digital identity, the many of us who do have a digital identity of one sort or another, and the idea of a source of truth, because it occurred to me that the truth about identity has to also include what is neglected, hidden or invisible. The emergent identity from the graph must surely be as much about what is not there as what is there. As I was thinking about this Vahid Masrour published a post in which he writes about how he discusses online identity with this students. He urges his students to consider how their digital identity might be interpreted by future employers. This highlighted for me the idea that we have to manage our identities, deciding what to reveal and what to hide. Stephen has said that identity in E-learning 1.0 and 2.0 was about the ‘quantified self’ where our digital identities were represented by demographics and numbers. E-Learning 3.0 will see us shift towards digital identities which reflect the qualified self and ultimately the connected self. For the connected self, being represented by numbers (the quantified self of E-Learning 1.0) and facts (the qualified self of E-Learning 2.0) will not be sufficient. The connected self will be more about our relations and interactions. Will this lead to a more ethical Web? Will digital identity as a ‘connected self make the ‘source of truth’ of these identities more visible? Will the ‘connected self’ be more reflective? Will ‘the connective self’ more honestly reflect our hopes, aspirations and dreams? Much of what is being discussed in this course is new to me and that includes the idea of identity graphs and the qualified and connected self. Stephen has clearly been thinking about this for some time. For further insights into his thinking I can recommend watching the video embedded above and reading this paper, which he shared as a summary of the week.